A.R. Menzies is able to provide excellent patient care with our onsite manufacturing capabilities, we are able to custom fabricate and modify devices at our clinic. At a later date, when modification or adjustments need to be made they can usually be done onsite, providing the client optimum service. 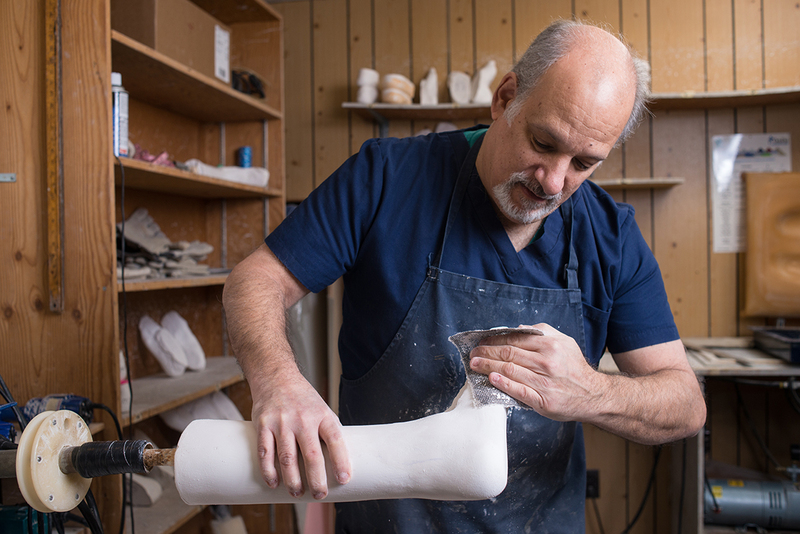 Our Certified Orthotist has completed an extensive training and certification process that includes, among other aspects, emphasis on assessment, device design and fitting procedures. Once certified, a mandatory continuing education program ensures that certified orthotists remain up-to-date with the latest development in technology and other areas relating to patient care. A.R. Menzies & Sons offers outreach clinics in Edmundston and Miramichi. What is an orthosis and how will it help me? The field of orthotics involves the design, fabrication and fitting of orthoses (braces or splints) intended to prevent or correct deformities, protect a painful part of the body or improve the function of a weakened or impaired joint or muscle. A custom orthosis provides protection or support in order to promote healing and build strength. What is a custom cranial remolding orthosis (helmet) and how may it benefit my child? After a child is born, parents are understandably concerned about their child and every aspect of their baby’s health. It is estimated that one in every 300 births results in a child with plagiocephaly-torticollis deformation sequence (flat spots; unevenly shaped head). Plagiocephaly results from several factors, including the child who persistently lies on one side of his or her head. Torticollis refers to the asymmetry of the muscles around the neck, causing the head to tilt and rotate to one side. Over time, the head takes on the shape of a parallelogram with a flat spot on one side of the back of the head with forward progression of the ear on the same side. 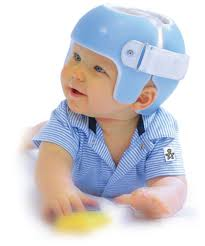 The cranial remolding orthosis (helmet) is designed to help with the reshaping of the child’s head. The helmet is custom-made from a cast of the child’s head and consists of a thick padding with a plastic outer shell and a velcro closure. By following a prescription from your doctor, treatment usually begins with the orthotist by the age of three to four months and is completed at the discretion of the orthotist and the attending doctor. 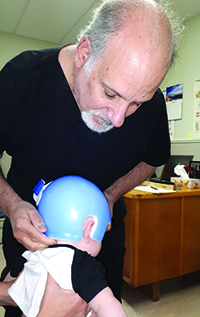 It is recommended that the child receive physical therapy as well as the helmet for treatment of the plagiocephaly-torticollis deformation syndrome. The child is seen for follow-up visits with the orthotist every two to three weeks and a progress report can be forwarded to the physician. Will bracing help osteoarthritis of the knee? Bracing can relieve some of the pain of osteoarthritis in the knee. The painful side of the knee, usually medial, is aggravated with any weight bearing activity. 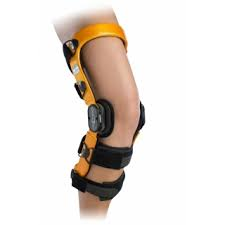 An unloader knee brace can provide pain relief and improve physical function. It does this by stabilizing the knee and prevents the outward thrust of the knee during this type of activity. It is also found that a neoprene sleeve can improve knee joint stability and prevent overuse of the joint (which is what causes the pain). Bracing the knee for osteoarthritis can be simple or complex. Your doctor and orthotist can do a complete assessment from hip to foot, in both walking and standing positions. Your doctor would then prescribe the level and type of bracing you would need. He moved from New York looking for a more "relaxed" life. Barry received his education at New York University, where he obtained a Bachelor of Science in Prosthetics and Orthotics. 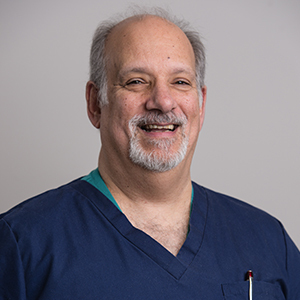 In 2007, Barry wrote his Canadian Orthotics exam and became Canadian Certified. I would like to thank you for the many years of great service I have received from your company. I was very happy to meet their people who know what they are doing and how to treat people with mobility impairments like mine. My special thanks to Barry who was always very professional and friendly. I really appreciated his experience, his prompt and reliable service. My sincere appreciation goes also to Sandra and her colleagues, always very friendly and smiling. I would highly recommend your professional services to anyone with mobility impairments. Good luck and success!" Orthotics Prosthetics Canada (OPC) is the representative national organization for the prosthetic and orthotic profession. Its role is to protect the public and advance the profession through quality standards of practice, professional credentialing, education and awareness.